In 1880 the brothers Samuel and Septimus Frearson revamped their popular Illustrated Adelaide News to become Frearson's Monthly Illustrated Adelaide News. The older title had leaned towards sensationalism in its last years, with an outspoken but conservative editorial policy. In contrast, Frearson's Monthly avoided strong editorial opinions. In fact, its editorials were often identical to those printed in the second Frearson newspaper, Frearson's Weekly Illustrated. 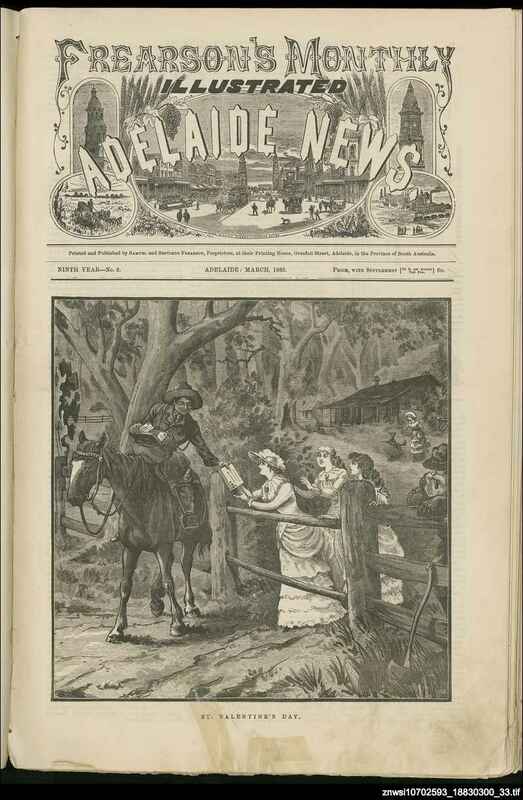 The newspaper opened with a sixteen-page special issue filled with illustrations of places and buildings around South Australia. In addition there was a 20 page supplement, and special 'birdseye views' of Adelaide and Port Adelaide, that is, artists' depictions of those places as if from the air - probably inspired by balloon flights. The Melbourne Exhibition was attracting huge crowds including many South Australians at this time, and Frearsons apparently produced this special bumper issue for sale at the Exhibition. In fact many of the illustrations had previously appeared in the Illustrated Adelaide News. Frearson's Monthly concentrated on its illustrations, while accompanying text consisted of snippets of news, serials, theatre reviews and special articles. There was a particular focus on New Zealand, with many scenic illustrations. Serials published in the newspaper were the same as those published in the Frearson's Weekly Illustrated, with local authors including Frank 'Atha' Westbury, George Loyau and the young AG Hales. Duncan Moodie, whose comic paper, Portonian, was printed by the Frearsons, contributed occasional articles about matters relating to his birthplace, South Africa. Both Frearson's Weekly and Frearson's Monthly shared the same artists, in particular HJ Woodhouse, George Leonard and Alfred Scott Broad. Sentimental syndicated depictions of Australian bush life often featured on the cover. Pictures such as those depicting fashionably dressed young girls receiving Valentine's Day mail were probably more imaginative than realistic. The final two to three pages of each issue contained advertisements, giving a good indication of the popularity of the newspaper. At the end of 1884 Frearsons advertised major changes in the coming year, projecting 'considerable improvements' and a 'greater variety of subject matter' (December 1884, p. 182). From 1885 the Frearsons produced a quality newspaper, the Pictorial Australian, in which they continued to experiment with the latest developments in newspaper illustration.